South Jersey Sports Online - Ask The Football Coach! Following are questions asked by our readers concerning the rules of football, as well as other aspects of the sport. If you have a question for Coach Derryk Sellers, click here to Ask the Football Coach! Thanks for your question. I would suggest that you have a conversation with the coach and find out why all the kids aren't participating in the drills. If that doesn't help then go to the commisoner of the league and voice your concerns also. Good Luck. Thanks for your question. You should go out early to practice and work on your throwing. Like I always say, in order to do something better you do the thing that you want to get better at. Go to www.lindenwoldchargers.org and all the info you need should be there. Thanks. Thanks for your question. I would recommend mom and dad and a good video camera. I don't have anyone that I use to film games. Sorry. Thanks for your support of Ask the Football Coach. You should try drive blocking. Let them block until you blow the whistle. What else you could do is (this might work best for older kids but you could try it) get the players to push a car in a parking lot. Have them push it so they can learn proper technique when they are blocking. When you block, its like pushing a car. Good luck. You should talk to your eye doctor and he should be able to help you with that. Remember that you can only wear a clear visor in the state of New Jersey. Thanks for your question. It is definitely possible for you to make the transition. If you are a good athlete and have the desire then I don't see any reason why you can't do it. Good luck! Thanks for your question. I think you should look at the big picture. You haven't played in over 5 years. I think you should get into a college and walk on. It is going to be a difficult road for you. The important thing is to get enrolled in a college and get a degree out of this just in case your football career doesn't work out. Good luck to you. Thanks for your support of Ask the Football Coach. I would suggest that you take him to as many football games as possible and let him watch it with you on television. I wouldn't suggest a formal training program at that age because he might grow to not like it. You remember the old saying: You can lead the horse to water but you can't make him drink. Good luck to you and your son. Thanks for your support of Ask the Football Coach. This is a situation that you and your son are going to have to sit down and discuss. Having a chance to be on the Varsity will be a good thing for him being only a soph. But you and him have to decide if this is what you both want. It should really be what he wants. Good luck. Creatine is not as harmful as steroids. It is only a supplement. I don't condone the use of anything but good old fashion food. I have some of my players who take creatine but I also have some that don't and the gains in strength are not much different. Good luck to you and your son. I don't know the rules of that organization but if the coach says that's the rule, then that is the rule. Your only recourse may be to go to the commissioner of the league and ask him. Good luck. Thanks for your question. The purpose of camp would be for him to try a couple of positions and see which one he likes the best. He can ask one of the coaches running the camp if this is possible. Good luck to you and your son. Thanks for the question. I am sure that the coaches there would consider him for whatever position he wants to play. Without seeing your son for myself, I would be unable to say if he would be good for the position. I wish him luck. Thanks for your question. I think because of the change in residence, he might not have to sit out. Go to the NJSIAA web site and read up on it. Look under References - Eligibility. Thanks for your support of Ask the Football Coach. I would suggest that you go to your local book store and look up books on football. Also try websites for football for dummies and there should be plenty of websites. Just type in football basics and that should get you some more help. Try the NFL's Beginner's Guide to Football. Good luck and have fun at the game. Be sure to go early to enjoy the whole experience. Thanks for your support. I would suggest like I always do, in order to run faster, you have to run fast. Work on running sprints 2 days a week and doing some distance (2-3 miles) the other 2. Good luck this season. The eye doctor can give you the prescription for the visor but it can only be a clear one. Good luck. Thanks for your question. I would suggest that you go to Coach Dass and ask him his opinion. Also tell him I said hello. He is a good man. As far as the visor is concerned, you should go to your eye doctor and he can prescribe one but it can only be clear. Good luck. The only line camp that I know of is at Rowan University. I forgot that they have one at the College of New Jersey also. Check their websites for more info (www.rowan.edu and www.tcnj.edu). Thanks for the support of Ask the Football Coach. I would suggest Rutgers University for camp. They do a great job with the younger kids. You could also check out Temple. They have a new coach (www.algolden.net)who is going to be offering a camp this summer. Thanks for your support of Ask the Football Coach. Thanks for your question. All the advice I can give you at this time is to work as hard as you can this summer and try to keep your expectations reasonable. Good Luck. I would suggest that you talk to the coach and ask him what his opinion is. I can not just give you my opinion because I do not know your son. Thanks for your support. I would suggest that you go to Coach Lawrence and ask for a playbook so you can be ahead of the game. Good luck. Thanks for your question. Continue to workout and run and believe that you will be a good player and in fact you will become one. Good Luck! Thanks for your question. There is in fact an excellent program, the Lindenwold Chargers (www.lindenwoldchargers.org) who will this season be the same color as the high school. I will get you the information as soon as possible. I would suggest that you call the NJSIAA at 609-259-2776 and they can get you the number to the chapter president in your area. Or you can try the NJ Football Officials Association. Good luck. Thanks for your question. The only way to get faster is to run faster. I would suggest that you either join the track team or do some running drills on your own. Thanks for your question. I would suggest that you call the school in which you are interested and talk to the coaches to see what their procedure is for walk-ons. Good Luck! Thanks for your question. I believe that if you are tranferring down you are okay. I think you have to sit when you make lateral moves. I would check with www.ncaa.org on that also. Good luck. Thanks for your support of Ask the Football Coach. I would suggest that you mix up your training. Remember to run faster, you have to run faster. Try running some 50's, 100's, and 400's. Also be sure to get in some distance as well (1-3 miles) twice a week. Good luck. Thanks for your support of Ask the Football Coach. I am not sure where you can get a perscription visor. I would ask the eye doctor the next time you see him. Good luck. Thanks for your question. You should check with the national Pop Warner or midget football association. They should be able to tell you what you need. Thanks and good luck to you. Thanks for your question. My recommendation would be to bring out Popsicles and hand them out. You want the kids to enjoy playing. Good Luck. Thanks for your support of Ask the Football Coach. With its big win on Friday night, Sterling has totally upset the playoff picture. This is going to be a very interesting end to the season. This is why I love high school football. Okay. Go to www.ncaa.org and look up eligibility. Your clock starts as soon as you have enrolled in classes. You therefore now should only have three years to play. I think it starts as soon as you enroll in class. Go to the website and check it out. Good luck. Thanks for supporting Ask the Football Coach. There is a big difference from midget football and high school. Although I feel that there should be some corelation between the two programs as far as having success, it is important to know that there are many factors that can affect this. Good luck with your program. Thanks for your support of Ask the Football Coach. I would suggest that you go talk to the coaches and find out if you can get involved with them in their off-season lifting program. My advice to you would be not to worry so much about trnasferring to a D-1 school but to make your mark where you are. Also, you will use up your eligibility by playing. Good luck to you. Thanks for your question. What I would suggest is that you get in touch with the coach and send your tape or just ask what is the policy for walkons. Good luck. Thanks for your question. My personal opinion is that your son may be too young to begin training with weights. Your goal should be for your son to enjoy playing and not become burned out with it by the time he gets to high school. I suggest to let him enjoy himself and the game. When he gets 13-15 you can begin training him. Good luck. Thanks for your question. I would check with the local high school and check the requirements. In NJ you must have 60 college credits to coach. I am not sure what the requirements are in SC. Try the www.schsl.org web site. Good luck and let me know how you make out. Thanks for your question. The only way for you to find that out is to practice, pratice, practice so the coach has no choice but to play you at qb. Good luck! Thanks for your question. If your son loves to play, I would let him continue. Look around the area for a league with a weight limit if that will make you comfortable. Other than that, you might have to live with him playing against bigger guys. Good luck. Thanks for your question. I am not sure that I know of anyplace that sells a prescription eye visor. Coach Derryk Sellers is the head football coach and athletic director at Lindenwold High School. He has also held the position of head coach at Edgewood Regional Senior High School, Cumberland Regional High School, and Hillside High School. Prior to coaching at the high school level, he coached collegiately at Lafayette University as well as Morehouse College. 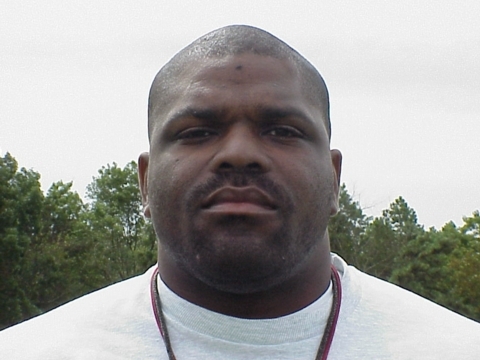 Coach Sellers currently is an executive member of the New Jersey Football Coaches Association, and was named their 2000 South Jersey Coach of the Year. He is instrumental in organizing the highly successful Nike Football Coaches Clinic, which is held annually featuring many major college coaches as clinicians.